Dinner @ Keisuke Tokyo Ramen, Parco Millenia, the newly refurbished annex adjacent to Millienia walk where Promenade MRT is located. Located on the top floor, it joins an array of 5-6 new “Wafu” themed restaurants in a shotengai concept, aptly named “Itadakimasu”. The shopping mall looks quiet on a weekend evening but there was already a queue in front of the restaurant when we reached. 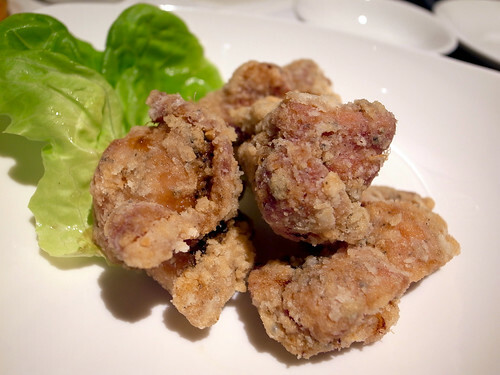 Tori karaage as what it should be, well…almost. The chicken pieces were well-marinated with the tangy gingery taste was refreshing to the palate. Alas the batter coating was not as crispy as we’d hoped for. But very tasty nonetheless. 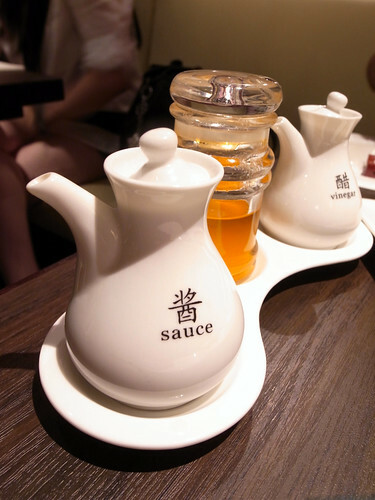 Tear-shaped serving plates with chopsticks locked into their rests. 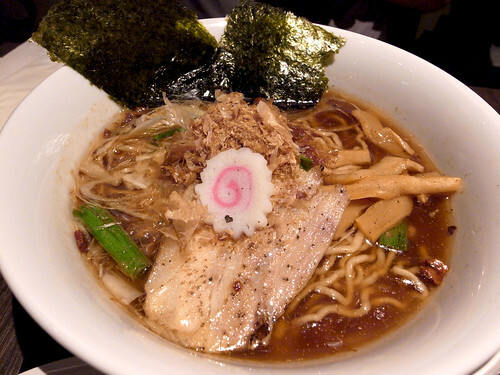 Rather classic presentation unlike the stereotypical ramen-ten. 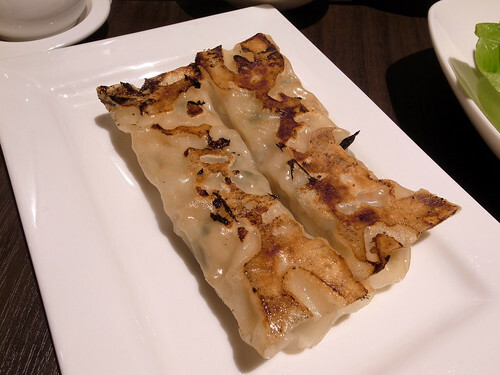 Ebi gyoza, very pricey at $7.50 for 2 short “chee cheong funs” of it but very delicious. We frowned slightly when it was first served only to release a smile when our teeth sinks into it. The skin was springy and had a glutinous-stickiness to it on the top while the bottom was to a delicate pan-fried crisp. Shrimp wrapped within were very succulent and flavourful. We were informed by the waiting staff to partake this with a “special vinegar” on the condiment tray which had an orange tinge, but we thought the flavours were very articulately balanced already and opted out of the vinegar recommendation. Alas the portion was small, i.e. one piece per person, leaving us begging for more. J’s prawn-based ramen which had a bit of everything in it, served in a bowl ressembling a wine goblet which supposedly helps to retain the aroma of the soup. The soup is just like what a Today Weekend review wrote, very “hay mee” indeed. But on second “sip”, it was more robust and full-bodied compared to our usual hawker fanfare. 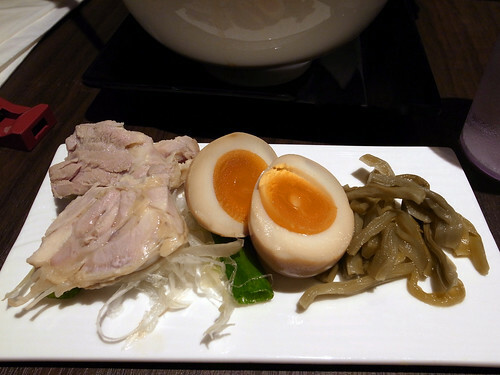 Ajitsuke Tamago (soy sauce boiled egg) with pickled Yamakurage 山くらげ which literally means “mountain jellyfish” owing to the chewy texture of this vegetable likening cured jellyfish. There’s also chasyu chicken which tasted like 白斩鸡 which was slightly undercooked by off-heat poaching to retain its tenderness and succulence . 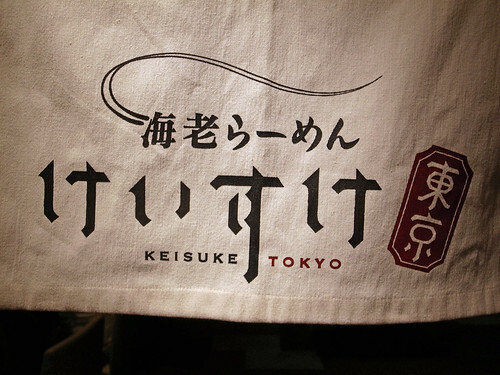 Note the difference in the anglicised text for “char siew” used by Keisuke Tokyo. 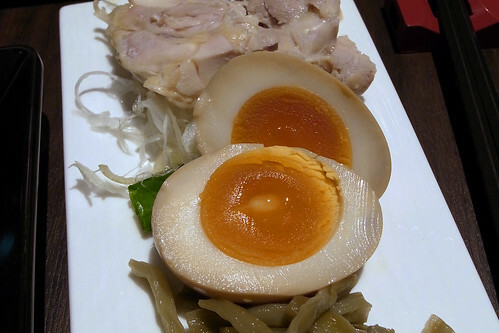 Close-up on the Ajitsuke Tamago has a soft yolk in the core but not too runny giving it an interesting soft texture. 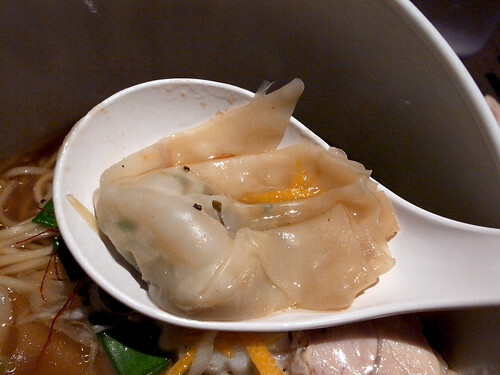 wontons looking drab but tasted heavenly. looks can be deceiving indeed. I opted for the simpler “house ramen” which incidentally serves as a litmus test to the quality of their ramen-making, and it did not disappoint. The tonkotsu soup base was very rich but not overbearing. The slice of charsyu was almost paper-thin, attestive to the chef’s knife skills but not very good for the diner. 😦 Otherwise the ramen was very good indeed. Diners at a neighbouring table ordered a seasonal item, “crab stock ramen” which had a consomme like consistency which looked rather interesting. The perfect excuse to come back for more to try this and other stuff on the menu. 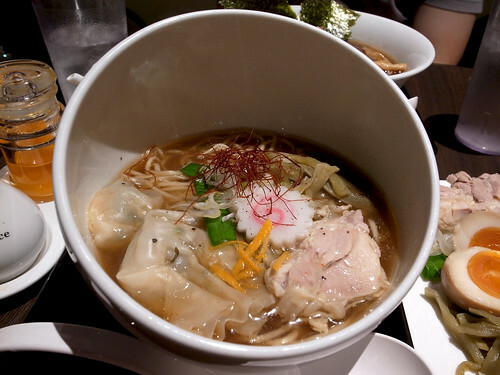 This entry was posted on August 7, 2010 by Alan (travellingfoodies). It was filed under Food and was tagged with Parco Millenia, Singapore.